The mobile accessories shops and kiosks at the mall are usually filled with walls of tablet and phone covers and carriers that add style and flair to your gadgets. However, accessories for mobile devices can do a lot more than protect your phone or give your gadgets some panache. The right accessories can extend the enjoyment of your devices and allow you to use them in ways you may never have thought of before! The following accessories also make great gifts, especially for those who are tough to shop for or have every gadget imaginable. Chances are you probably know a few people that could use several of these gadget add-ons. Kicking things off is modulR. ModulR designs one of the slickest case systems available for iPads. The company makes a variety of wall mounts and straps for shoulder carrying and secure handling with one hand. The beauty of the modulR system is that the protective hard-shell case connects to each of the different mounting and carrying options available. In other words, with ModulR, you only need one case for all the different ways you use your iPad. For example, a doctor can access information from her iPad on the wall in a patient’s room, carry her iPad on a shoulder strap without worrying where she last left it. Snap her iPad onto the car’s headrest so that the kids can watch a movie on the drive home and then mount it on the fridge to follow a recipe as she winds down her day. The modulR case system makes a thoughtful and practical gift for any iPad owner, protecting their gadget while giving them the ability to use their device in several ways. The majority of tablets these days come with GPS antennas installed. Add a turn-by-turn driving directions app and you’ve got a navigation system for your car with a large, easy to read screen. All you need is a good car mount and you’re ready to go. Car mounts make great gifts for those who have tablets because they extend the versatility of these all-purpose gadgets. In addition to having navigation systems think of the other uses. Passengers, especially kids, can be entertained. There are car mounts that attach to headrests so backseat passengers can watch movies or play games. Road warriors who regularly use their car as a mobile office can have their tablet’s touchscreen within reach at all times. Most car mounts are universally designed to fit any car. However, before you buy one, try to do a little online research on the car the mount is going to be used in to see if there might be any issues. Furthermore, consider the size of the device to avoid mounts that may block part of the driver’s view, such as those that attach to the windshield. A large-screen smartphone might be okay for a windshield mount, but a 10-inch tablet is probably too big, in which case a mount that attaches to the car’s dashboard is more appropriate. 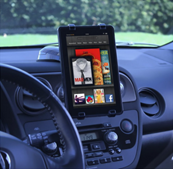 The Satechi tablet and smartphone dashboard mount (pictured above) is compatible with several of the most popular tablets and mounts on the car’s dashboard instead of the windshield to maintain a clear view for the driver. Also, anyone who uses the previously mentioned modulR case system for their iPad, can use an extended strap system from modulR that turns the case into a car headrest mount for backseat passengers. For someone who has a tablet, a headrest mount accessory makes an inexpensive gift that they (or their kids!) are sure to appreciate. Tablets and smartphones are great productivity tools, helping us stay connected to our work and business wherever we are. But don’t forget that when it’s time to unwind, these gadgets were designed for entertainment! Movies, games, music, radio, even TV can be enjoyed anywhere with today’s mobile devices. When I travel I like to bring my gadgets along. There’s nothing like sitting under a tree on a beach, sipping a beverage with a little Steely Dan in the background on iTunes. However, when you’re outdoors the stock phone or tablet’s speakers won’t cut it. Heck, when you’re indoors they often don’t cut it! That’s why I always carry a pair of portable speakers with me on my trips. I’m going to go out on a limb and assume there’s someone on your list who loves music. A set of portable Bluetooth speakers can turn their phone or tablet into a mobile jukebox. The highly-rated Creative D100 Wireless Bluetooth Speaker unit is less than $50 on Amazon, and is available in blue, green, pink and classic black. I really like this Creative speaker system. The speakers are housed in a single unit, which is a big plus for travel, no wires to fuss with and untangle. If you like to listen to your music a little loud, not only do these sound great, but you don’t have to worry about a speaker vibrating off a table and falling on the floor (which drives me nuts!) like some smaller, separated speakers. Some may think these are a little heavy to carry around compared to smaller speakers. I don’t think they’re heavy, for trips I just put them in my backpack. I’ve tried smaller Bluetooth units that are lighter and more portable, but the sound just doesn’t cut it for me. Many new phones these days have wireless charging abilities, also known as “inductive” charging. With charging pads, devices begin charging simply by laying them down on the special charging mat. Several phone models from HTC, LG, Motorola, Nokia, Samsung and other manufacturers feature wireless charging capabilities. With the price of wireless chargers and charging pads down significantly this year, these make a nice option for an affordable gift this season. Be sure to get a “Qi-Enabled” charger, which is the standard for most mobile devices. Also keep in mind that some Qi-compatible phones don’t automatically come with a wireless charging battery cover. Charging covers can be obtained online or from the carrier who sells the particular phone. Phone carriers, such as Verizon, also sell kits for specific phone models, like the Samsung Galaxy S3 and S4. If you’re worried about buying a wireless charger that is not compatible with a particular phone, just head over to the carrier’s store and see what they recommend. 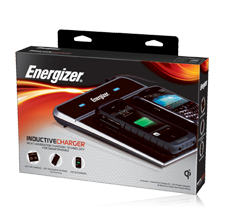 The Energizer Qi-Enabled 3 Position Inductive Charger (pictured above) features a large pad designed to wirelessly charge two devices at the same time. There is also a USB port allowing simultaneous charging of three devices. Keep one on an entryway stand, turning it into a charging station for the family, a nice reminder for anyone as they walk through the front door to charge their phone. A charging pad can also serve as a designated phone storage area for those always forgetting where they left their phone. Note: If you’re thinking of getting a wireless charger for someone who has an iPhone, they won’t be able to charge their iPhone natively with it. iPhones, even the new iPhone 5, do not support wireless charging at this time, though there special cases, or “sleeves“, available that can allow for inductive charging.